Sourdough bread has been there for ages and it's an iconic bread in San Fransisco. Celebrate National Sourdough Bread Day on April 1! Sourdough bread is likely to have appeared in 1500 BC in Ancient Egypt. Using of naturally occurring lactobacilli and yeasts for dough is considered as one of the first forms of leavening known to the bakers. Unlike breads made with cultivated yeast, sourdough has got a mild sour taste that appears due to the lactic acid produced by the lactobacilli. Sourdough was the main bread during the California Gold Rush and today it is a part of San Fransisco culture. Variety of sourdough in San Fransisco has remained in continuous production since 1849 and some bakers even can trace their starters back to the Gold Rush period. 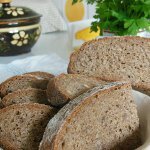 Sourdough bread is a great side to you stew or soup. You can also toast bread and eat with your morning cereal. If you want to make homemade sourdough bread, you will have to create a starter. But if you don't want to awake your inner baker, go to the bakery and buy a loaf of fresh sourdough. This will be a great way to celebrate this holiday.